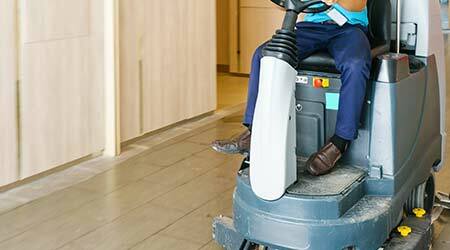 Given the choice, janitors are more likely to favor ride-on floor care equipment — and for good reason: Standing or sitting on a machine is more comfortable, less tiring and quicker than pushing a walk-behind machine, according to floor care equipment manufacturers. One manufacturer estimates that the top speed for walk-behind machines is between 2 and 2.5 miles per hour. However, custodians struggle to keep up the pace and typically walk slower than 1 mile an hour by the end of the shift. Ride-on equipment can cost two to five times more than walk-behind counterparts, on average. However, despite their higher price tags, ride-on machines are attractive alternatives to walk-behind equipment for building service contractors who have to contend with rising labor costs and high employee turnover. Productivity rates for ride-on machines are further boosted by large-capacity water tanks, which extend the time between dumping and refilling. So, if walking behind a machine is out, does it make more sense for janitors to sit or stand while operating ride-on equipment? And which option is safer and more productive? Some manufacturers favor stand-up machines because it is easier for an operator to get on and off than a sit-down model, thus improving safety and increasing the likelihood that the operator will exit the machine when necessary. The stand-up machine also has a smaller footprint than a sit-down machine, making it easy to maneuver and access tight spaces. For instance, elevators and narrow or congested hallways are no longer off limits with a stand-up machine. And the machine’s compact size makes it easier to store than traditional ride-on equipment. When discussing the ergonomics of stand-up machines, manufacturers are divided: Some say standing up and steering for hours is uncomfortable and places the operator’s body in an unnatural position. Others disagree, however, countering that their stand-up machines are designed with the operator’s comfort in mind. One thing manufacturers can agree on is that sitting is more comfortable than standing for long periods of time; however, some believe that a standing position is preferable from a safety perspective. Young has seen machines driven off docks and down staircases by operators who were nodding off. He has even had a machine go through a plate glass window. From a safety standpoint, a number of manufacturers also favor stand-up units because they offer a better vantage point.